High quality optical components coated with special film, created a high- quality optical images. Formed flat and good contrast image, especially in the peripheral visual field, it is more bright and clear. 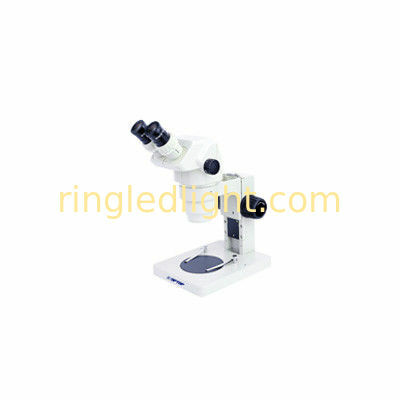 Zoom objective lens 0.67X~4.5X (6.7:1), standard magnification 6.7X~ 45X. Use optional auxiliary lens, the magnification can be 2X~225X. The standard working distance is 100mm, use optional auxiliary lens, the working distance can extend to 26mm~287mm, to create enough space for the user. Viewing head 45°or 60°inclined, diopter adjustment in two tube, ensure the different vision of users to get a clear image. Suit to ergonomic design, the best height of the eyepoint, uses feel less fatigue when long time use. A variety of accessories, expanding the application areas. STM-BN-SZ9040:Binocular head, 45° inclined, zoom objective 0.9X-4.0X, working distance 100mm. STM-BN-SZ6745A:Binocular head, 60° inclined, zoom objective 0.67X-4.5X, working distance 100mm. STM-BN-SZ9040A:Binocular head, 60° inclined, zoom objective 0.9X-4.0X, working distance 100mm. STM-TN-SZ6745TR:Trinocular head, 45° inclined, zoom objective 0.67X-4.5X, working distance 100mm. STM-TN-SZ9040TR:Trinocular head, 45° inclined, zoom objective 0.9X-4.0X, working distance 100mm. STM-TTN-SZ6745ATR:Trinocular head, 60° inclined, zoom objective 0.67X-4.5X, working distance 100mm. STM-TN-SZ9040ATR:Trinocular head, 60° inclined, zoom objective 0.9X-4.0X, working distance 100mm. SZST3 pillar type transmission stand, top & bottom halogen illuminator 12V15W (brightness adjustment).